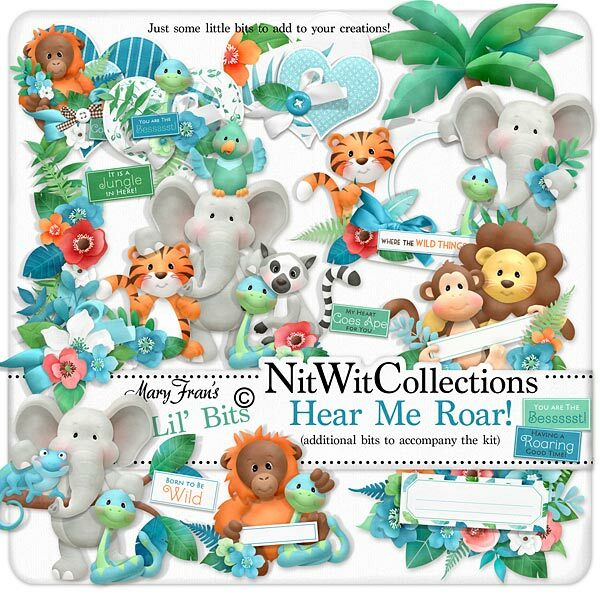 Lil' Bits "Hear Me Roar" blends together the individual digital elements into fantastic clustered embellishments that are perfect for your centrepiece image or so easily placed in anywhere to achieve stunning results in your cards, mini albums and scrapbook layouts! Don't miss out on these digital elements as they are not included in the FQB "Hear Me Roar" Collection so please don't miss out on owning and creating with these elements! 1 Cluster of animals that include the elephant, parrot, tiger, snake and lemur...can you say cute personified?! 1 Frame cluster - "Where the Wild Things Are"
1 Heart cluster with the adorable orangutan - "My Heart Goes Ape for You"
1 Heart cluster with the charming snake - "You are the Besssst"
1 Word tag - "Having a Roaring Good Time"
1 Word tag - "My Heart Goes Ape for You"
1 Word tag - "Born to be Wild"
1 Word tag - "It is a Jungle In Here"
1 Word tag - "You are the Besssst!"